Ending Wednesday at 1:50PM BST22h 39mMetal: Sterling SilverStyle: ChokerLength: 16 - 17.99"
Natural, five cabochon Botswana agate gemstone pendant which has been dyed pink and white. It is possible that your pendant may be made up from both natural and synthetic stones. There are 6mm and 8mm white crystal spacers inbetween the beads and a square diamante spacer inbetween the 14mm centre bead. Collection station availableStyle: ChokerLength: 16 - 17.99"
Green Aventurine and Multi Colour PearlsGemstone Green Silk Bead Necklace. Green Aventurine pear 50mm x 40mm x 6mm. Green Aventurine toggle bar clasp. Choker Necklace. Necklace structure made from green silk. MADE WITH OFFSET DRILLED BLACK / SILVER PEARLS WITH STERLING SILVER CUP SPACERS & A SILVER TBAR & RING CLASP. FOR YOUR CONSIDERATION IS THIS GORGEOUS DESIGNER MADE BLACK PEARL NECKLACE. GREAT GIFTING PIECE. Purple Crazy Agate and Purple Silk Gemstone Bead Necklace. Choker Necklace. Purple Crazy Agate square 50mm x 50mm x 6.5mm. Purple Crazy Agate toggle bar clasp. Necklace structure made from purple silk. Est. delivery dateEst. delivery Tue, Apr 23Style: ChokerLength: 16 - 17.99"
Lots of Cabochon red Garnet oval shaped stones are used to create this magnificent necklace. 3 cm long Garnet bunch is used in the middle and gradually garnet are used on either side to make the chain. This is a flexible choker, and has been carefully constructed so that it tapers from the inside edge to ensure comfort (as well as beauty!). In total, the necklace weighs a very respectable 23 grams. This being a quality studio/designer necklace, I am in no doubt that this is indeed genuine 925 sterling silver. Green Amazonite and Multi Colour Pearls Gemstone Green Silk Bead Necklace. Amazonite heart 50mm x 50mm x 5.5mm. Amazonite toggle bar clasp. Choker Necklace. Necklace structure made from green silk. Pearl multi coloured 5mm - 10mm. Exquisite Italian 18ct white gold filled simulated sapphire necklace. 18ct Gold Filled. Elegant 18ct. Multi-Tone Gold. Pearl & Diamond Necklace. Fully Hallmarked & Tested as 18ct Gold. Display Bust is not life size, See Photographs For Size Comparison. Lovely quality hollow 925 sterling silver rounded rigid sleek choker necklace with a vibrant and sparkling pink cubic zirconia marquise drop slider pendant. This is made with good quality silver, to a great standard so it would be ideal for daily wear. 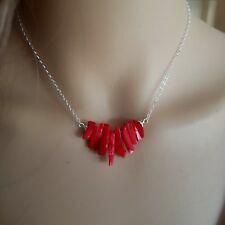 A natural polished gemstone necklace. Spring ring clasp. Not fully hallmarked but Stamped 925 and tests as sterling. Up to 17" in length and 1.2cm at the widest point at the front. And teardrop shaped silver mother of pearl charms, minimalist style. very good pre-owned condition (couple of tarnish dots on chain). Pretty solid silver necklace/choker. Est. delivery dateEst. delivery Thu, Apr 25Metal: Sterling SilverStyle: ChokerLength: 16 - 17.99"
Gift for her, red leather choker, clover shaped onyx. 2 clover shaped black onyx stones with sterling silver chain and charm carrier, finished with 3mm natural red leather band and sterling silver clasp and extension chain. 18ct White gold Cultured Pearl Necklet / Pendant / Necklace RRP £350.00 WEDDING! Stunning 18ct White Gold Wavy Cable Necklet. Birmingham Hallmark for 18ct gold. THEY HAVE BEEN IN STORAGE EVER SINCE. The pendant itself comprises a huge titanium blue-steel-grey coloured mabe/blister pearl in an elaborate Art Nouveau style silver setting depicting floral, foliage and tendril detailing. This is a reasonably flexible choker with sufficient "give", in order for it to be comfortably eased over the neckline.